After three-plus years, two seasons, and 40 episodes, Gravity Falls came to an end this week. Dipper and Mabel Pines concluded their one crazy summer in the Oregon by defeating the inter-dimensional demon Bill Cipher once and for all, defeating his reality-rending reign of terror just in time to celebrate their 13th birthdays. Following the episode, The A.V. 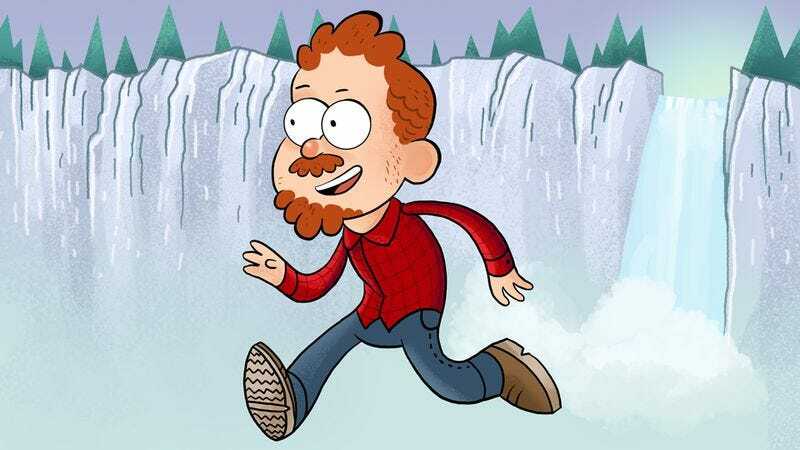 Club called up creator Alex Hirsch for one last Gravity Falls chat, discussing tearful Pines family farewells, the finale’s surprise guest star, and how the path to Weirdmageddon was paved in part by Jon Stewart. The A.V. Club: Does it feel like it’s really over? Alex Hirsch: I wrote the last episode a year ago. Animation is such a slow process, so I was emotionally dealing with this conclusion a year before our audience was—and even before that, I knew that the series wasn’t going to go on another season. I’ve had a lot of time to prepare for this, so I feel quite good right now. AVC: Was there a moment in that process where you felt like there was closure? AH: Gravity Falls is a very hard show to produce. I was not permitted for the longest time to let the world know that it was only going to be only two seasons. Season one was such a difficult thing. I’d never made a television show before, and just the type of show this is—the amount of callbacks and continuity, the level of artistry, the complicatedness of it—was very taxing. And in the middle of season one—I remember I was on my fourth all-nighter in a row—I promised myself, “This is it. You’re not making another season. You’re done.” Because I was wiped out. AVC: What moment of the finale do you find the most touching? AH: I’ve watched these shows so many times that watching it is like hearing my own cell phone or my alarm clock. For the most part, it’s just a blur. But there is one part that always gets to me still: When Grunkle Stan says goodbye to Dipper and Mabel. I am Grunkle Stan: I am the voice of Grunkle Stan; my profession, much like Stan’s, is to be this carnival barker delighting and confusing kids and taking them for a strange ride. So when Grunkle Stan says goodbye to Dipper and Mabel, that’s me saying goodbye to Dipper and Mabel—saying goodbye to working with Jason Ritter and Kristen Schaal, saying goodbye to working with my crew, and saying goodbye to an amazing experience. I do get a little misty when I watch that scene even after seeing it 100 times because as hard as the show was, I genuinely love the team I got to work with. I’m proud of what we did. And I do love the fans. Of course it means so much to me, and I can’t help but feeling it when I see that scene. AVC: Given that growing up and learning how to let go of things are two of the major themes of the show, was there a meta element to making this episode, where everybody was working through their own feelings of letting go of Gravity Falls? AH: [Laughs.] Absolutely, and that’s intentional. Gravity Falls’ ending, in many ways, is about endings. In “Dipper And Mabel Vs. The Future,” this is where we first introduce this idea. Mabel says the words, “I don’t want to say goodbye to Gravity Falls” to Grunkle Stan. She is going through what any fan is going through: This feeling of “There’s some special, magic thing that I love that’s temporary.” In her case, that’s the summer—but in a larger sense, childhood itself. And the show is definitely metaphorically meant to take you through that experience of growing up. It was always meant to be a show about childhood and transitions and, indeed, about the fact that it’s not infinite. To me, it’s a more powerful statement about that transition to make something finite than to let something limp on and on indiscriminately just because it’s popular. AVC: Was there ever any point in the production of “Weirdmageddon 3: Take Back The Falls” where you considered keeping Grunkle Stan’s memory wiped? AH: You can look at a finale as chance to make an impact or a statement, to shock people or shoot a big cannon and make a loud noise. To me, it’s more about a chance to give the characters that I love what I want for them personally. Some people could say, “I’d like something that’s super dramatic and miserable and made me cry and made me sad forever” [Laughs.] but that’s not my taste. The most important thing that I wanted to see in this finale was the family getting a proper goodbye. I wanted to see Grunkle Stan as himself—fully intact, not a damaged version of himself, not a lost version of himself. I wanted a Stan who knows these kids to look them in the eye, and them to look him in the eye, and say goodbye. If I had a longer [episode running] length, I would’ve taken a bit more time with that transition of him getting his memory back. The important thing to me was to reach that ending at the bus stop where all the characters are there with each other. That to me is more important than being shocking for the sake of being shocking. AVC: How did you get Kyle MacLachlan to play the bus driver? AH: [Laughs.] When we were casting this episode, we had this realization that we had this three-line part for a bus driver. But there was something—when Dipper and Mabel get on that bus, they’re not just leaving the town, they’re leaving the show. They’re going somewhere, and we don’t know where they’re going. They’re going on to a future that’s a mystery for us, and I wanted to feel like they were in good hands. [Laughs.] Gravity Falls has so much inspiration that comes from Twin Peaks, the idea of Agent Cooper being the one to drive Dipper and Mabel home made me feel like, yeah, they’re going to be all right. AVC: Did you have anyone in mind as a back-up if he didn’t have the time to do it? AH: We were so down to the wire finishing this episode that if he didn’t have the time to do it, I don’t think we would’ve had a second choice. I probably would’ve ended up doing it myself. That’s one of the reasons I [Laughs.] do so many voices on the show. Guest stars take so long to get back to us, and then it’s too late, and I have to run into the booth to record it the day before we finish the episode. AVC: In a neat bit of synchronicity, the Gravity Falls finale aired on the same night as a new episode of another of your big influences: The X-Files. Did that have any significance to you? AH: It’s weird because we live in this age of reboots. Everything is getting rebooted: The X-Files, Twin Peaks. We have shows like Gravity Falls that were inspired by these shows, that are now ending and being followed up by reboots [Laughs.] of the shows that inspired them. It is cool to be living in this time. It makes me wonder if a thousand years after my death, we’ll probably be seeing Gravity Falls 9000, where they’re all robots. People whose grandkids’ grandkids’ grandkids love the show are remaking it. There was a role that I really wanted to get David Duchovny and Gillian Anderson to do on the show. We went out to them and they were busy and they passed. AVC: It wouldn’t be a Gravity Falls conversation without a little bit of crazy theorizing. One of our commenters noted that the show ended on February 15, 2016 and it premiered on June 15, 2012, and if you format those dates as numerals, they’re symmetrical: 2/15/16 and 6/15/12. Any thoughts on that? AH: Pretty cool, huh? It’s something that a bunch of fans noticed and have tweeted to me. A lot of people say, “Oh, did Disney intentionally put it on this date to create this mysterious palindrome significance?” And they’re giving Disney’s programming department way more credit [Laughs.] than it should have. This is a coincidence, one of thousands that are brought to my attention on a daily basis. It’s an interesting thing: Once you train an audience to look for significance, they start to find it everywhere. They find it in the clouds and in the rocks and in dates and in numbers. It introduces almost a religious mindset where almost everything can be seen as a brilliant plan by a mastermind. But plenty of these are a total coincidence. It’s given me a greater respect for the randomness of the universe. To see how many of these pop up—and they’re often credited to me. People think it’s my brilliance on display—I’m just as surprised as they are. It’s cool to watch that folklore rise up and evolve in real time on Twitter and Tumblr. In the course of an evening, you’ll go from one person having a thought to 2,000 people deciding that it’s canon, and then people making up quotes where I say that was my plan all along. It’s bizarre to watch these stories be birthed and then crawl and then run and then knock down my door and ask for my response. But many times, they are just one of life’s mysteries.